Do you enjoy learning complicated things? Do the meanings of these things allude you? 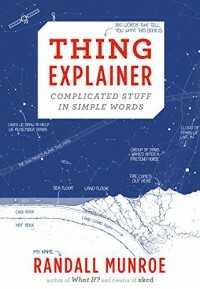 If so, Thing Explainer by Randall Munroe is just the book for you. 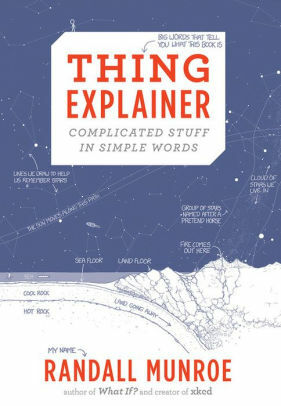 This book, takes complicated-to-understand things, such as cells, nuclear power plants, and Mars rovers and uses a delightful combination of pictures and easier words to help you understand them. This book is also one for lovers of humor. Contrary titles, such as "Bags of Water We're All Made of" or "Hand Computer" to explain things such as cells or cell phones creates hilarity in places where it isn't usually found. The juxtaposition of these simple titles and the complicated things they are representing creates for a refreshing new view of extremely interesting and complicated subjects. I often times wonder how graphite is put into pencils, or how locks function. With this book, I was quickly able to understand things that once confused me greatly. After reading this book, I feel that I have acquired more knowledge than I ever have before. Once you have read this book, I am absolutely sure that you will feel the same way.